DAVID HIMBARA (THE MEDIUM) – Rwandan Ambassador Valens Munyabagisha and Rwanda diaspora president in Australia, Manuel Karekezi, are literally holding the remaining Athletes at the village under house arrest. The Ambassador is shown by the arrow in the picture. 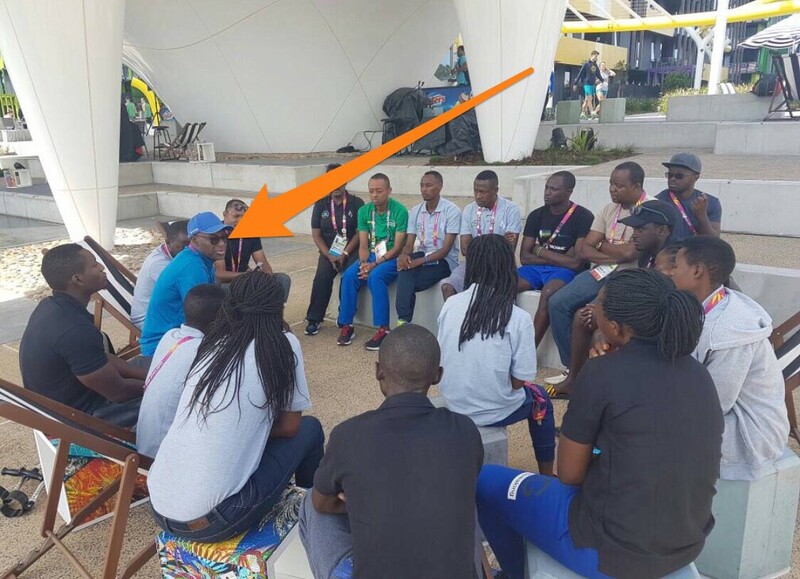 The Rwandan team at Gold Coast Commonwealth Games in Australia is in crisis after another Rwandan escaped from the Games village this afternoon (April 15, 2018).So far, a coach and an athlete have fled the Commonwealth Games — they have disappeared. They do not wish to return to Kagame’s Singapore of Africa. Rwandan Ambassador Valens Munyabagisha and Rwanda diaspora president in Australia, Manuel Karekezi, are literally holding the remaining Athletes at the village under house arrest. The athletes’ passports have been withdrawn too. It’s chaos in Australia. The Rwandan ambassador is now stationed at the Games Village. He is virtually holding the team under house arrest until departure. This is because it is feared that more Rwandans might vanish after the closing ceremony. Kagame would rather that the athletes are held, hostage. The Rwandan ambassador is now the prison guard.